Imagine being trapped inside a Disney movie and having to learn about life, language, and emotion mostly from animated characters dancing across a screen of color. A fantasy? A nightmare? Life, Animated is the real-life story of Owen Suskind, who is the son of the Pulitzer Prize–winning journalist Ron Suskind and his irrepressible wife, Cornelia. Since Norrin’s diagnosis almost six years ago, I’ve read many memoirs written by autism parents. Though few have moved me the way Life, Animated by Ron Suskind has. It’s a familiar story if you’re an autism parent. The joys and dreams of those first few years of parenthood. Followed by the devastation of an autism diagnosis. Then the search of answers, services and appropriate school placement. Life, Animated is a journey of denial, loss, acceptance, hope and learning to live with autism; the story of a family wanting desperately to connect by any means possible. What resonated with me the most is the tug or war of emotions when you have a child with autism. I understand Suskind’s desire for “people to see [Owen] as smarter, and more able” and the urge to “fix” autism. And I understand his wife’s need to accept and move forward. Autism itself is not always the struggle. Sometimes the struggle is learning to cope with our own expectations for our children.While the Suskind’s share the many joys of their journey, they do not stray from the heartbreak that comes with it. Elegantly written, full of humor and honesty, poignant and powerful Life, Animated will change the way you look at autism. And you will never watch a Disney movie in the same way ever again. I had the honor of interviewing Ron Suskind, you can read the Q&A on Parents.com – HERE. 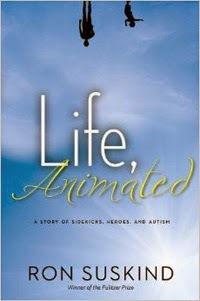 For more on Ron Suskind and/or to read an excerpt of Life, Animated please visit http://ronsuskind.com. And be sure to visit lifeanimated.net a site to keep readers informed about the book and to create a place for a community of people who want to connect and share the affinities of their children. Disclaimer: I was provided with a copy of Life, Animated for review purposes. All opinions are my own.